If you are looking for lighter hair this summer but you don’t want to use dye or any other harsh chemicals on your hair, there are some great ways to naturally lighten your hair. The methods won’t cost you a lot of money and most of what you need is most likely in your kitchen right now. All of the methods listed below have all natural ingredients and are actually healthy for your hair as well. Lemon juice is probably the most popular natural way to lighten your hair. The key to properly using lemon juice to lighten your hair is that you stick to real lemon juice and not any products that claim to have lemon juice in them. If you don’t want to juice the lemons yourself, you can buy straight lemon juice in a bottle but just make sure there are no additives to the juice. Mix one part lemon to one part water in a spray bottle and then apply it to your hair wherever you want your hair to be lighter. If you want faster results you can head out in the sun after applying the lemon juice and let the sun work it’s magic on your hair. The longer you leave the lemon juice on your hair, the better results you will get. You should see visible lightening of your hair after one use but you can continue using the lemon juice until it lightens up more if you want. Chamomile tea is another great way to lighten your hair for only a few dollars. You will need to brew a strong cup of chamomile tea and then let it sit for awhile until it gets cooler. Rinse your hair with the tea and try to leave it on for at least 15 minutes. You can do this daily to help gradually lighten your hair until you have your desired shade. You can also apply the chamomile tea to your hair using a spray bottle and then head out in the sun if you want to see faster results. After about 20-30 minutes, wash the tea out of your hair. If you don’t mind gradually lightening your hair as well as moisturizing it at the same time, use a good olive oil on your hair. Use 2 or 3 tablespoons of olive oil and run it through your hair, making sure to coat all of it. Let the olive oil sit on your hair for at least 30-40 minutes and then your hair like you normally would. The oil can be used everyday or a few times a week if you notice your hair getting too greasy from the olive oil. Here’s an extra added bonus tip. Honey also works really well when it comes to lightening your hair as well. Check out our post on how to lighten your hair naturally with honey. Keep in mind that any of these methods listed above won’t take your hair from dark brown to blonde. It will help to lighten your hair approximately 1-3 shades depending on your hair and will give you a natural look to it. 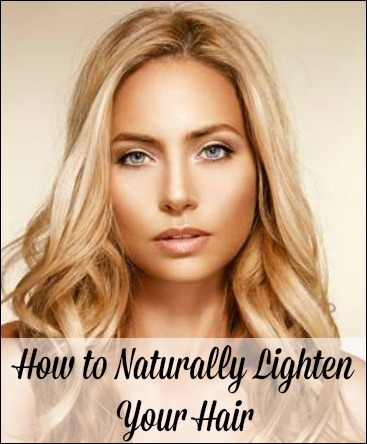 So, if you are looking to just lighten up your hair a few shades and you don’t want to use any chemicals on your hair, definitely try the natural lightening methods above.